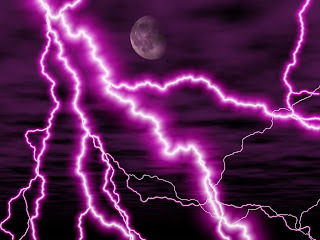 I've had fun with purple, but it is time to put it to bed and move on. With an empty purple scrap jar, I'll square up my crumb blocks today and spend a few minutes tidying so that I can move on to the next color. I'd give you a hint, but honestly I don't remember. I have a list though which I will look up and hint away in the very near future. So show us the last hurrah of your purple scraps and get ready for what is next. 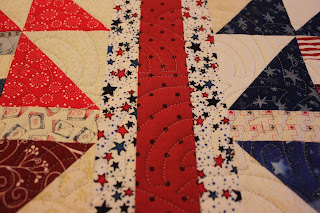 After that I think I'll spend some time on pieced borders. Smith Mountain and Flamingo Bay are both finished except for that part. I'd like to get at least one of them on the frame in the next few days. My to do list gets wide open after that, as Mom called to request a couple of quilts for family members, I will feel better about starting those if I can empty out the bins a bit. I had a great time workshoping. This was a week long summer institute in preparation for a complete redesign of the AP Biology curriculum. It was intense and full of good information. See the adorable agar blocks we used to test the relationship of surface area to volume? 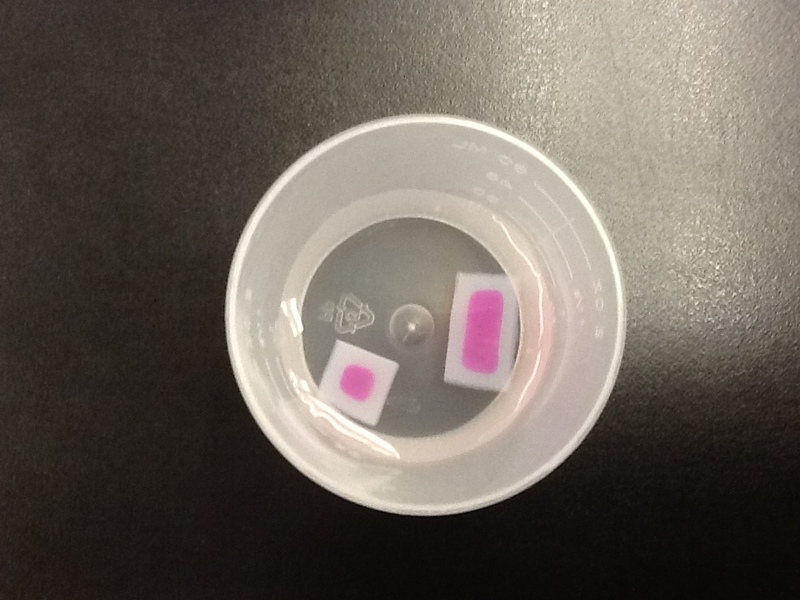 The pink is an acid base indicator which changes to clear as acid diffuses into the block. I roomed with a teacher from our school who was there to do the calculus workshop. Each evening, after dinner, I worked diligently on test questions, syllabi and such so that I could get up the next day and do it all over again. The first half of the week was spent in constant dampness as Debby continued to move through the state. Those were the days when we were all disoriented and wandering lost around the second largest campus in the country. It made me thankful to NOT be a full-time student anymore. By midweek though, the storm had passed leaving BEAUTIFUL weather behind. We had learned to navigate the campus and felt confident enough to venture out and explore a bit. 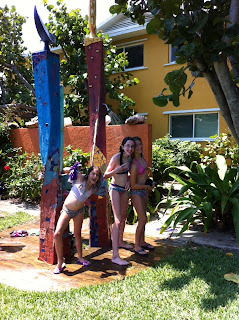 While I was off at my training, the girls were enjoying surf and art camp. Like me, they started out dealing with the storm, but were able to get out and enjoy the beach by the middle of the week. Wednesday they started the day watching a nest of baby sea turtles hatching and Thursday they saw dolphins and horseshoe crabs on a kayaking trip. 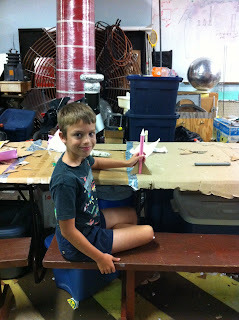 Ryan was at Mr. Science again, this time doing a crime scene camp. Their final day was spent analyzing an apparent homicide to figure out how Mr. Science ended up dead in a pool of blood. Poor Kurt was just plain worn out after all the dropping off and picking up. He had a lot going on at work, but had to squeeze it all in between his chauffeur duties. They were all glad to see me, especially because I was able to drive straight to the beach when my class ended and see the girls surf while also saving Kurt from yet another car trip. Almost no sewing went on. I did take my Dear Jane quilt to work on the hand sewing, but chose to focus on school work instead to get the most out of my time away. Being all out of Midget blocks ready to go, I decided to do a little preparation. 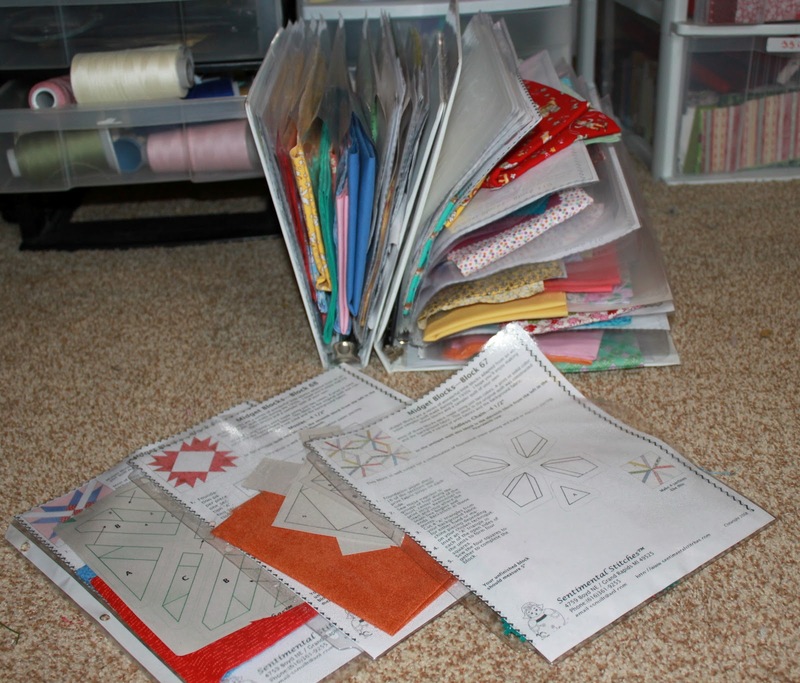 The rest of the published blocks are right there in two binders, just ready to be sewn together. I'm out of town all week at training, but maybe next weekend will be a Midget Mania Marathon? 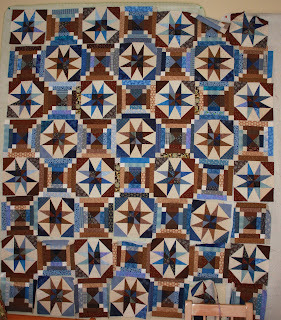 I have more done than there are left to do, unless some more blocks come out soon I'll have to start improvising. 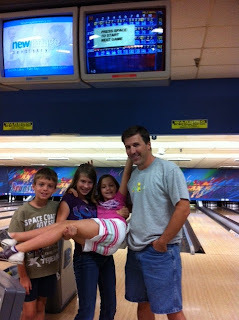 Because Debbie brought us lots and lots of rain today, the kids wanted to go bowling. We are still watching to see which way she will go and if she will get any stronger. Hurricanes are just part of the charm of living in Florida. 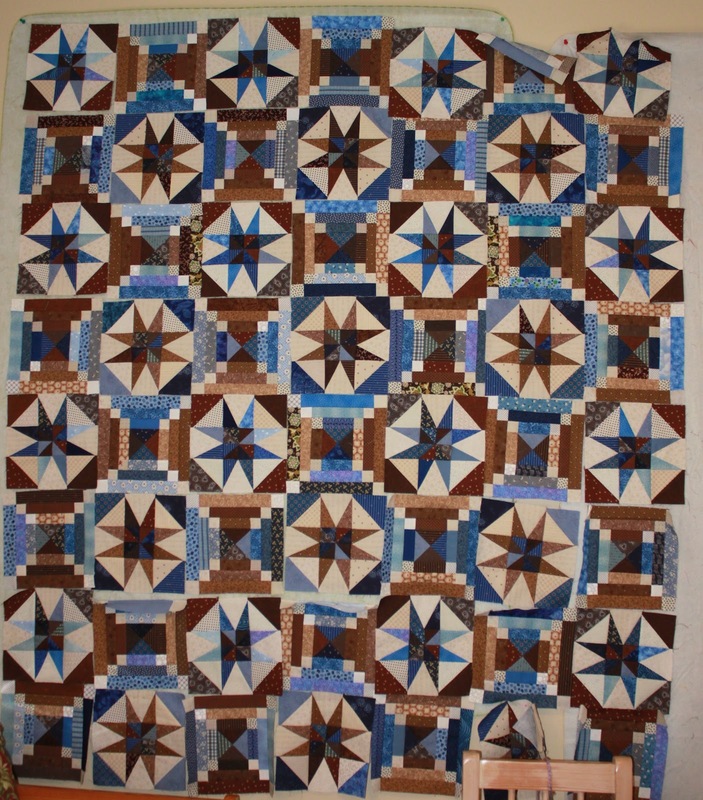 I was on a roll with machine quilting and thought I would take on the Dear Jane that has been sitting in a cupboard for a while now waiting for hand quilting. 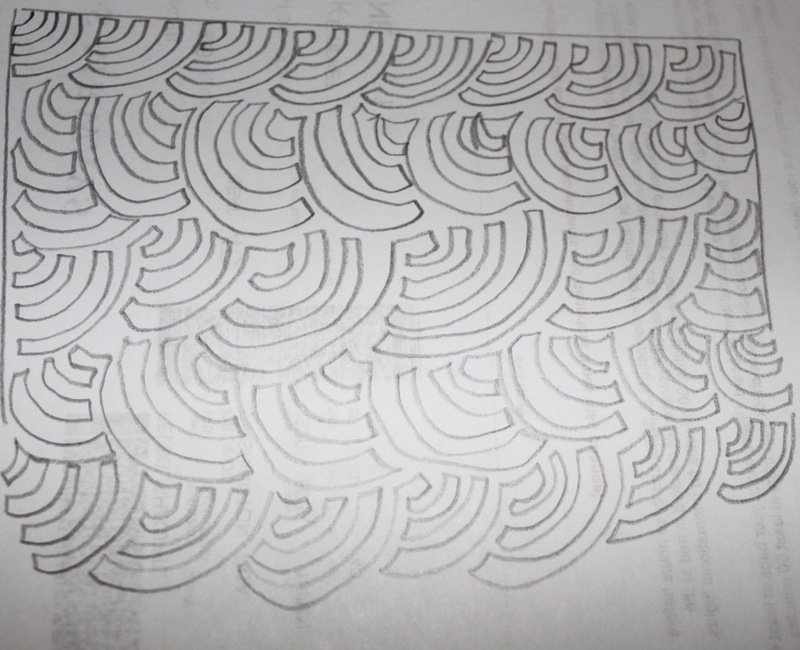 I got two rows done before deciding that it just didn't look good. It looked like a child had drawn all over my quilt. Instead I switched the machine to a long basting stitch and basted the rest for hand quilting. I'll be out of town for training next week and this will make a nice take along project for the hotel room. 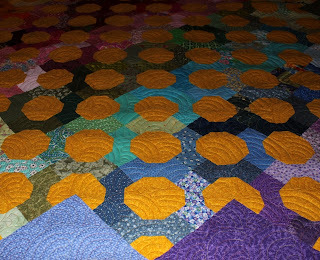 This really is a quilt that calls for hand work, and it isn't all that big with only 48 blocks. The rest of the day was busy with binding. There are now 7 quilts in my stack waiting to have the binding hand sewn to the other side. I guess I won't be bored during TV time for a while! 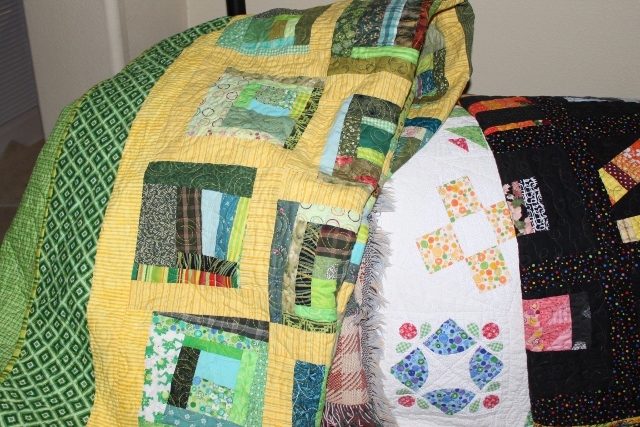 4 of these were quilted during my weekend marathon, the other three were already done and waiting for the binding to be made and sewn on. Now I need to go reassemble the sewing room and get things put away so that I can pack and get ready for my training tomorrow. Shifting gears is so hard to do. 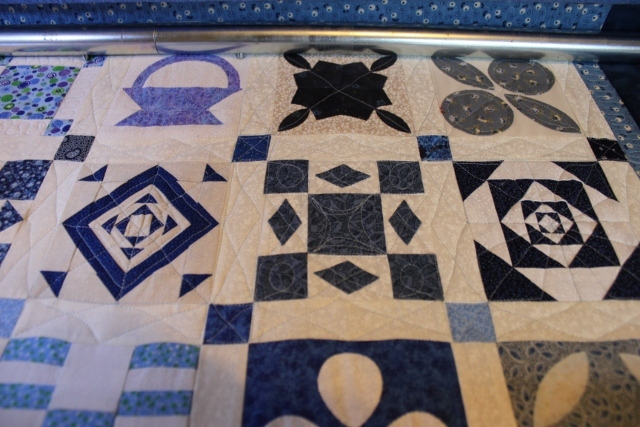 I am actually in physical pain from standing in front of the quilting frame all day long. Just pulled the Bow-ties off though, so I will call it a night. 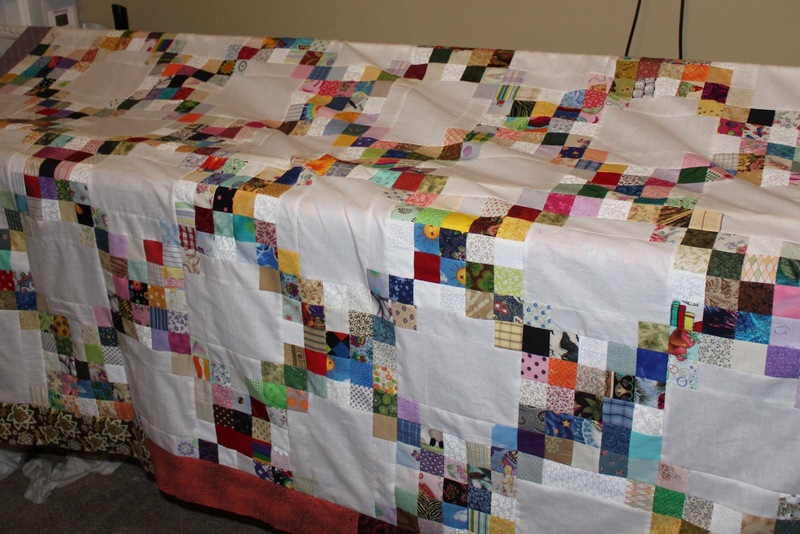 Tomorrow will start with binding and cleaning up some of the aftermath of a marathon session of quilting. For now, stick a fork in me, I am DONE. 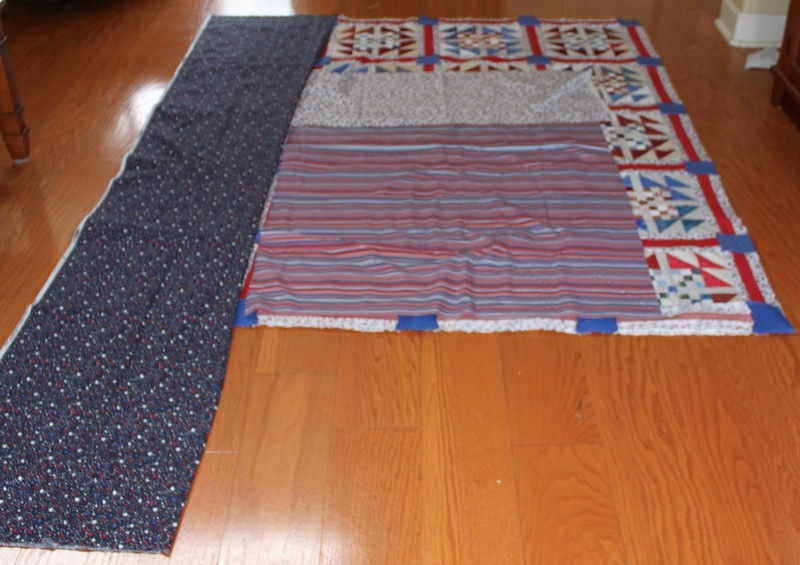 As soon as dinner was done, I started piecing a back for the bow-ties. I'm not sure why I think they need to go with green, but as I am fresh out of anything yellow, I think green will work nicely. I think I'll get this one loaded up while I ponder quilting patterns. First though, I'd better run out to the store, we ran out of milk during dinner and will need some for breakfast. This little guy didn't take long to quilt up. I'll do the binding after dinner. Not crazy about the multicolor thread or the swirls in the snowballs. I'm moving on though, 'cause I'm still on a roll. Rolling right along, this little baby quilt was next up. 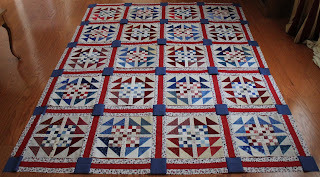 The middle part was done last January for the Rainbow Scrap Challenge. 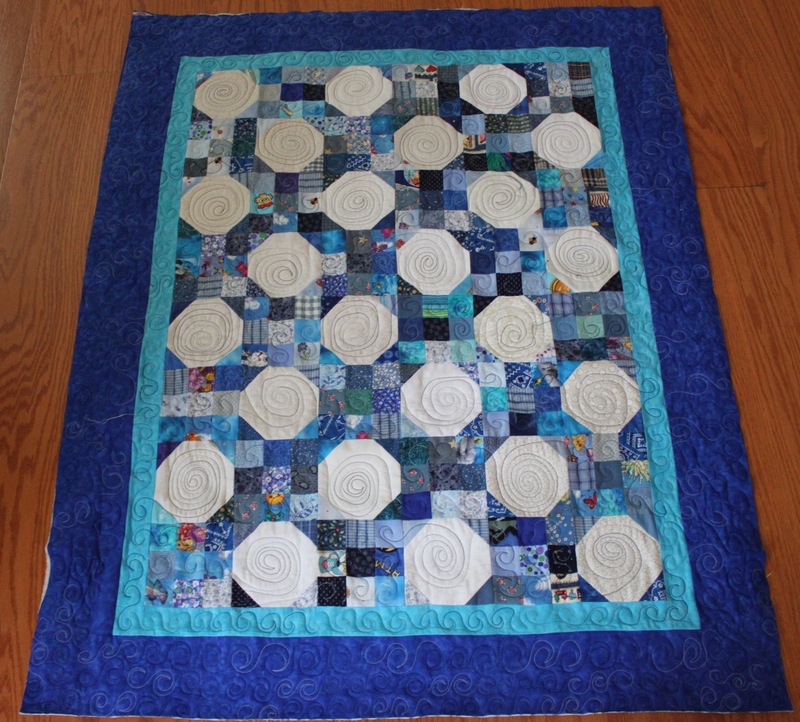 I added the two borders today and found a piece of blue fabric big enough for the backing. There was even some leftover batting from the last couple of baby quilts that were gifted away, so this little guy is ready for his turn on the frame. I found some blue variegated thread that I think will work for the quilting. I have a vision of swirls swimming through my head. Initially I pictured a big set of concentric circles in each open block, but I'm not sure I will end up there. I don't know of anyone having a baby boy right now, but it never hurts to be prepared. When faced with a big pile of unfinished projects, what is there to do except take a deep breath and pick one? This is the second on my list of quilts that needs to be finished and I am REALLY happy with the quilting. I am branching out and trying to find new free motion patterns to experiment with. This is a free hand Baptist Fan with three humps and about an half inch per blade. It is really hard to get a good picture of the quilting. It is amazing how well the sandstone colored thread blends in with all the different fabrics. 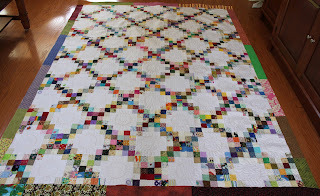 I'll go get it trimmed and bound before taking a break and choosing the next project to cross of the list. 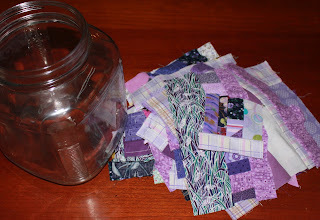 With just two more purple Saturdays left in June, I am out of purple scraps! Look at that empty jar! 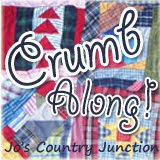 I have a nice little stack of purple crumb blocks that I will square up to 6.5 or 3.5 inches, but nothing else. How is your stack of purple scraps looking? Is your stack of finished blocks bigger than your stack of remaining scraps yet? Use the linky below to share your purple projects so far. 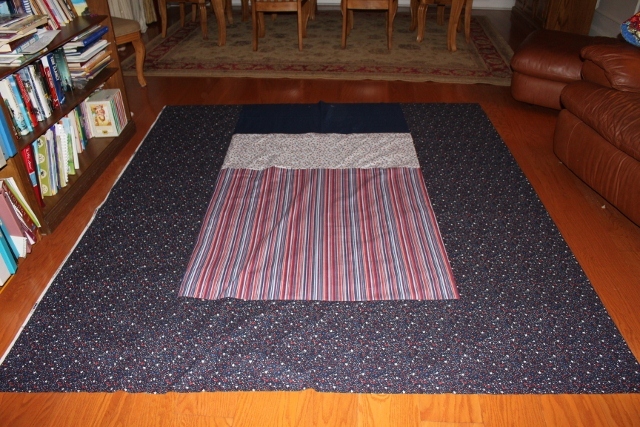 Got the back for the goose quilt put together. 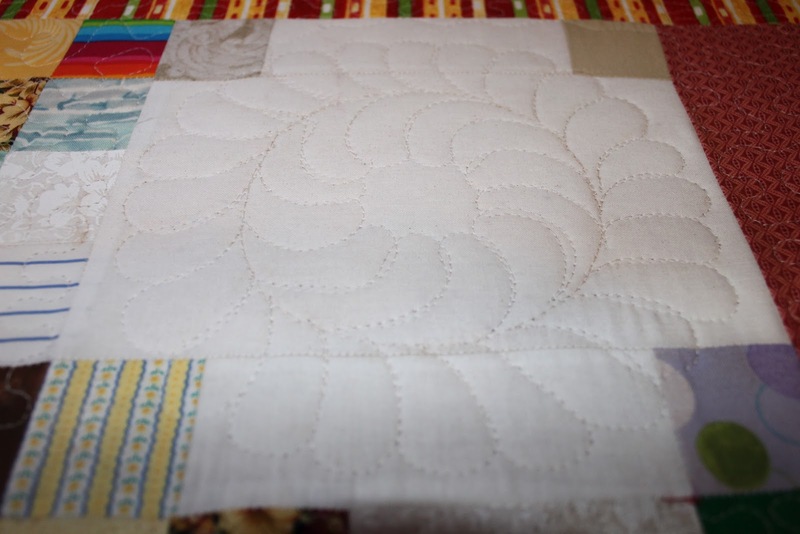 Thought about doing a pantograph for the quilting, but couldn't find just the right one. Instead, I thought it would be fun to try some Baptist Fans. 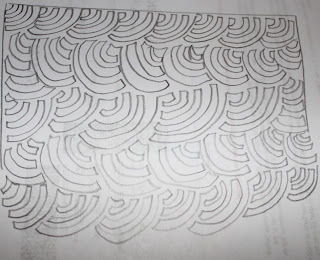 After figuring out that I needed to quilt them upside down, I did a little practice on scratch paper. I think I'm going to like it. The top thread is called sandstone, and the bottom is blue. I was having tension issues for a bit, but I think it is working great now. 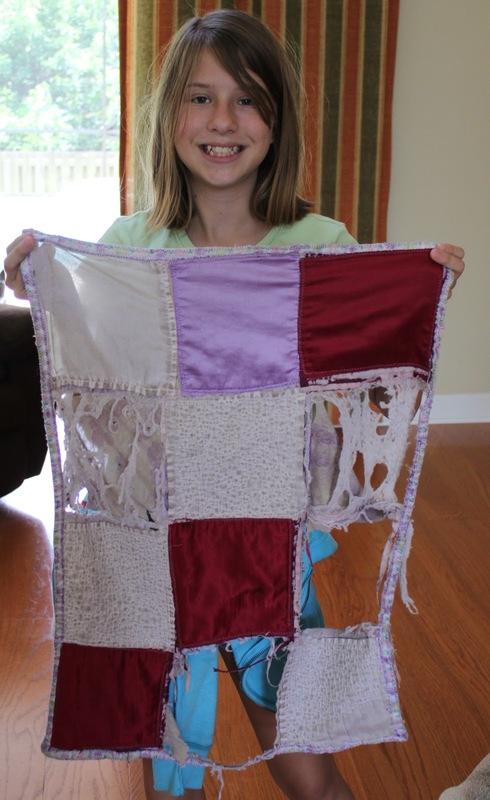 Anna's special blanket has been remade. 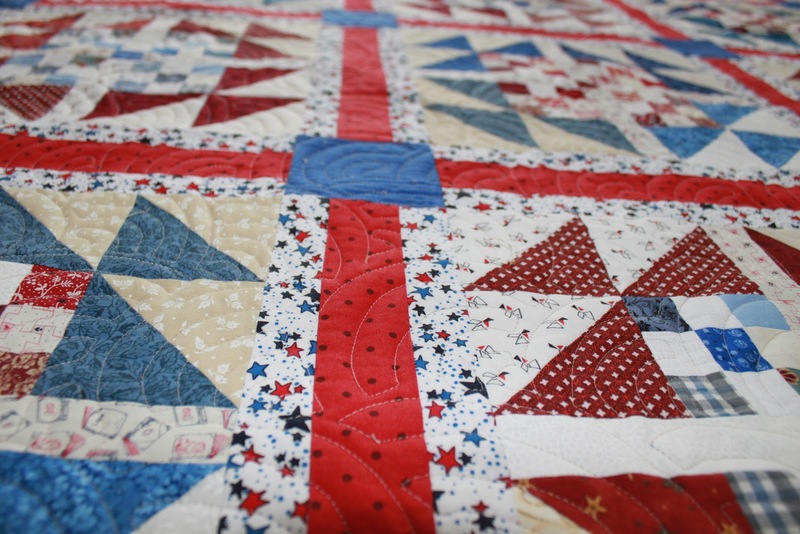 Though I was not allowed to discard any of the shreds that remained, I was permitted to applique specially chosen squared on top of the old tatters. Trying to get the batting to stick to empty space was a trick, but it all came together in the end. Most importantly, it was done before bedtime. With the Irish Chain waiting for handwork on the binding, I pulled another down from the line up. Goose in the puddle is one that didn't need a pieced border, so it came next. 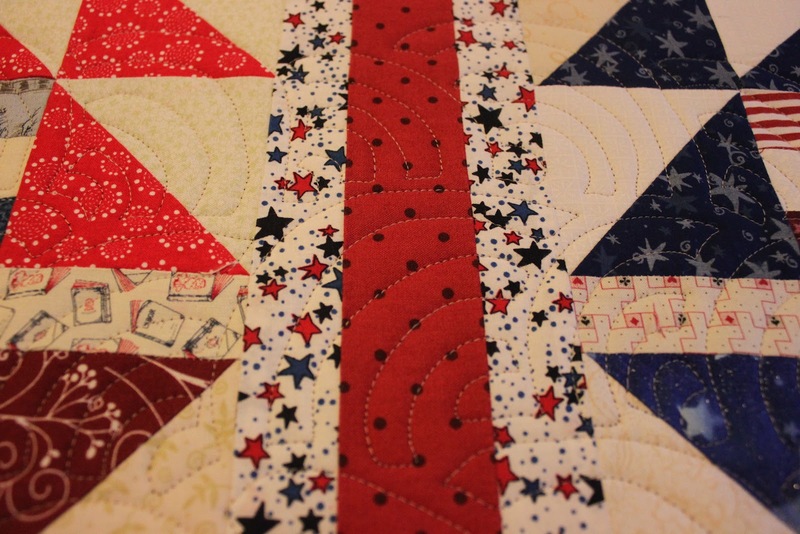 I think there is enough yardage to make a nice patriotic themed backing. If not, I still have extra nine patches that will make a nice little insert in the center portion. 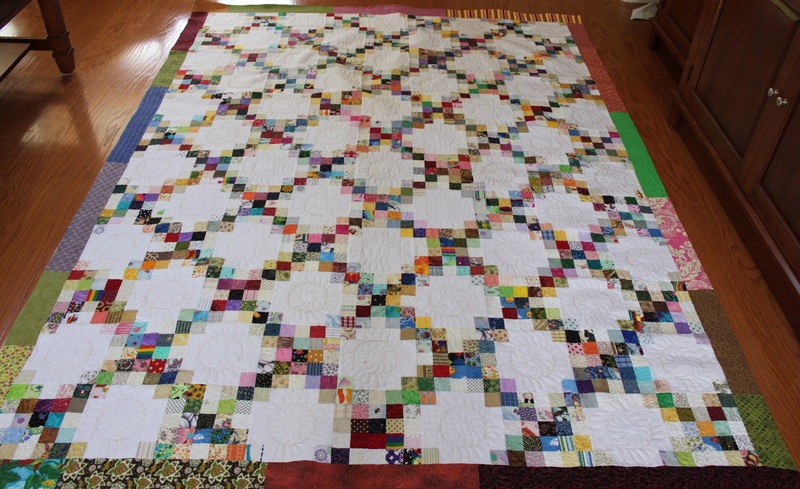 I'm ready to jump in and start piecing, but now the kids are in the pool so I'll have to sit and watch them for a while. The scrappy Irish Chain sat on the frame for a couple of days while I worked through all those feathers. Binding is next. 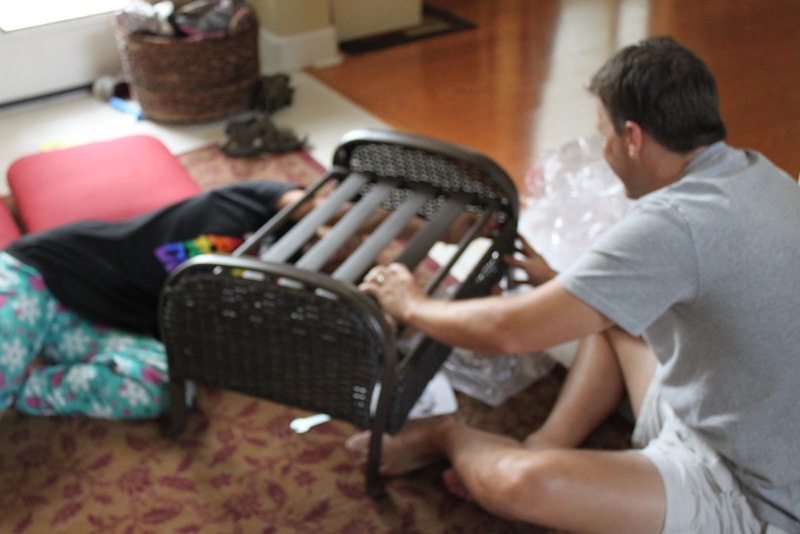 First though, Sydney wants to go to the paint store to pick out chips so that we can redo her room. 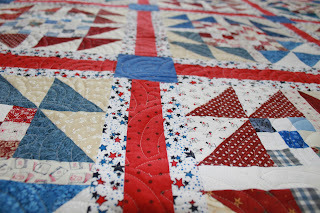 Quilting is definitely coming in small bursts this summer in between driving the kids around. 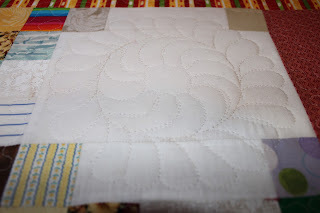 I was putting off quilting the Irish Chain because I wanted to do a feather wreath but didn't have a stencil. So I made one using a pattern traced from a book onto template plastic. I then sewed over the pattern with an empty needle and pounced it with cinnamon. Look -- a feather! Not exactly perfect, but I've got a few more to do, so I'm sure I'll be really good at it by the end. I feel like I've been very productive lately, but still haven't managed to finish anything. The finished flimsies are piling up. I just need to follow through and get them done. When Anna was 18 months old, she started to play with silky slips and bits of satin. She seemed to like the texture. 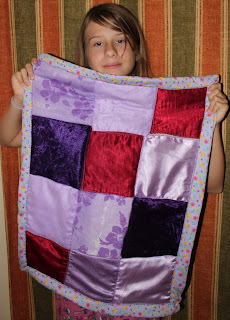 I made her a nice little blanket out of purple satin and she named it Boo Botty. She got purple and blue confused and wasn't quite able to say blanket yet. She carried it with her everywhere until an unfortunate airplane ride when she was three where it got left behind. After two hours on hold with the lost luggage people, I gave up and made a Boo Botty 2.0 so that she could sleep at night. Too say Boo has been loved a lot would be an understatement. I offered to make Anna a new blanket with lots of soft, fluffy fabrics. Instead, she asked if I could fix this one up for her. Of course I can. Just a little bit of reconstruction and Boo will be good as new. This isn't actually a midget block. It isn't even a miniature block. I just wanted to make one, and doing it in the same size as the midgets means it isn't a new project. 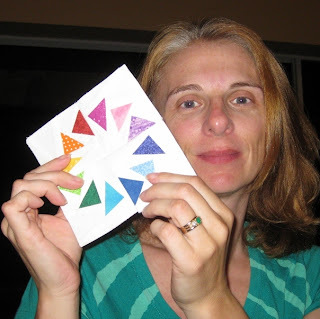 There is a free paper piecing pattern at Piece by Number which I just resized so that it was about 4.5 inches. Honestly, how cute that? I didn't even step foot on the freshly painted patio today. Although I tried to talk the kids into swimming so that I would be forced to sit and watch them, they were all busy doing other things. Instead I got the blocks for Smith Mountain put together. I'm working on the pieced border now, so it should be ready to go on. 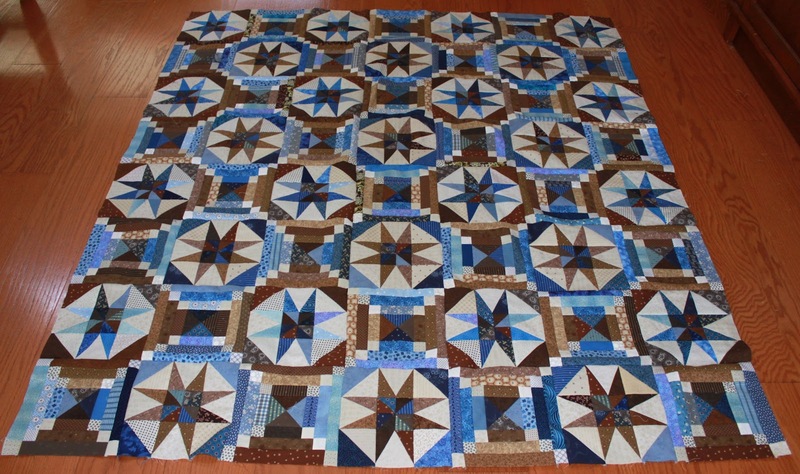 The pieced border for Orca Bay is still in waiting, I guess that will be next on the list. Red Tag fabrics were on clearance last week and I found two nice big pieces to use for backing fabric. My stash is getting very low, especially when it comes to large amounts of one fabric. There are three quilts hanging over the quilt frame as I type, so I'd better start getting creative on finding backing possibilities. 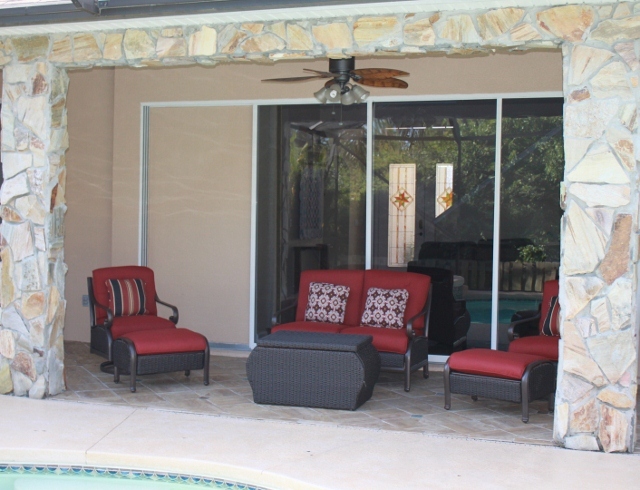 The patio is freshly painted, the new furniture is assembled. Makes you want to settle in with a good book and relax a bit, doesn't it? Today turned into a busy day after all. Kurt and I got the deck painted this morning. It looks so fresh and clean now! After that I went out to lunch with a girl friend and took advantage of a big sale going on at Joann's. She is making a t-shirt quilt for her son to take away to college in the fall and I am giving her a little help along the way. 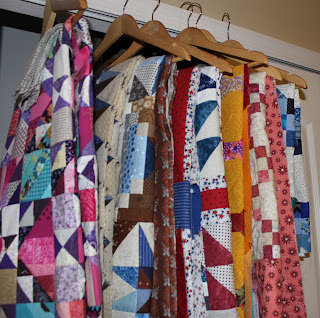 We also hit Goodwill where we got lots of fun goodies along with the extra shirt we needed for the quilt. I did find a few minutes this morning while Kurt was picking up another gallon of deck stain to whip up a couple of purple goose blocks. These little guys are just perfect for the extra triangles that come from joining binding. I'm not sure what they will turn into, but for now I'll just keep adding to the collection. There are five purple Saturdays this month, so still plenty of time to use up all your purple scraps. My jar is still pretty full. I am thinking about a few little houses and maybe some basic mile a minute blocks for today. How about you? Any progress on purple to report? Use the linky below to share. There is something so odd about a trial based on the testimony of a pack of 8 year old girls that I can't even begin to describe it. Sydney mostly just remembered that it was long and she had to wait a long time. 5 hours later we were finally done. No sewing today. Honestly, I haven't been home at all until just right now. There was a piano lesson and a Math Camp finishing ceremony, now I am going to collapse on the couch for a while. 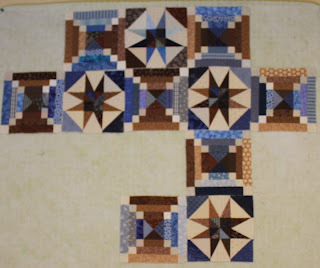 I was sure I would get the blocks done for Smith Mountain Majesty yesterday. Life got in the way though, and it wasn't until today that I found those last few minutes between carpools to sew the rest. Ryan wanted to see The Avengers in order to round out our Marvel superheros marathon. He was pretty adamant about wanting to see it in 3-D. Ryan doesn't get adamant about much, so we planned the day around that. Since I was dropping off for math camp and the theater in is the same general direction, we spent the morning in my classroom finishing off the painting in the storeroom. I had gotten most of it done during post planning, but the cabinet doors and drawer fronts and shelves still needed to get painted and put back together. After that it was off to see the movie which lasted until it was time to get Sydney from her camp. Theoretically there was still time to sew in the evening, but it would have taken some sort of energy or enthusiasm, and I was fresh out of both. Have you ever had those evenings when you just sit on the couch thinking you are going to get up any minute, but never quite make it happen? 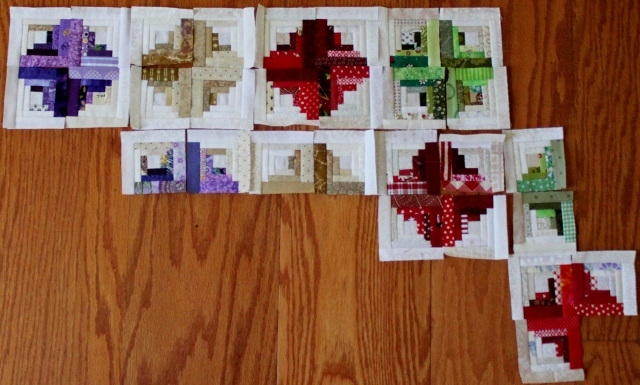 I think I'll go get the blocks pinned together now before they all start falling off of the wall. I like to look at them for a while though and make sure that the balance and distribution are good. There is probably enough pieces and variety in these guys that it would be hard to find a cluster of similarity anywhere. I still need to cut out the pieces for the borders, after that I can empty out the tub and figure out what is next. I have been spending a little time for the last few evenings cutting out a BOM pattern that I ordered as a kit from Connecting Threads. For some reason it just never moved to the top of the list. 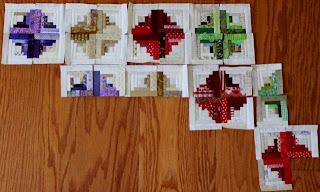 I think about half of the blocks are cut out now and nicely organized in little baggies with directions. Sydney wanted a shoebox for her magic show though, and the only one I could find was holding the quilt kit. This is Midget block 64. It is called Shaded Trail and is hand pieced in 24 pieces. Not every block can a favorite or a standout. This one will just fade into the background. Today Ryan wanted to have a superhero movie marathon while his sisters were at camp. He made popcorn for us both as we sat through Thor followed by Captain America. Tomorrow we will top it off with The Avengers which is still in theaters. Obviously I couldn't just sit and do nothing while all that movie watching was going on. Instead I pulled out the little basket that sits on the end of the ironing board to catch leaders and enders and odds and ends. Boy do those little guys build up in a hurry! 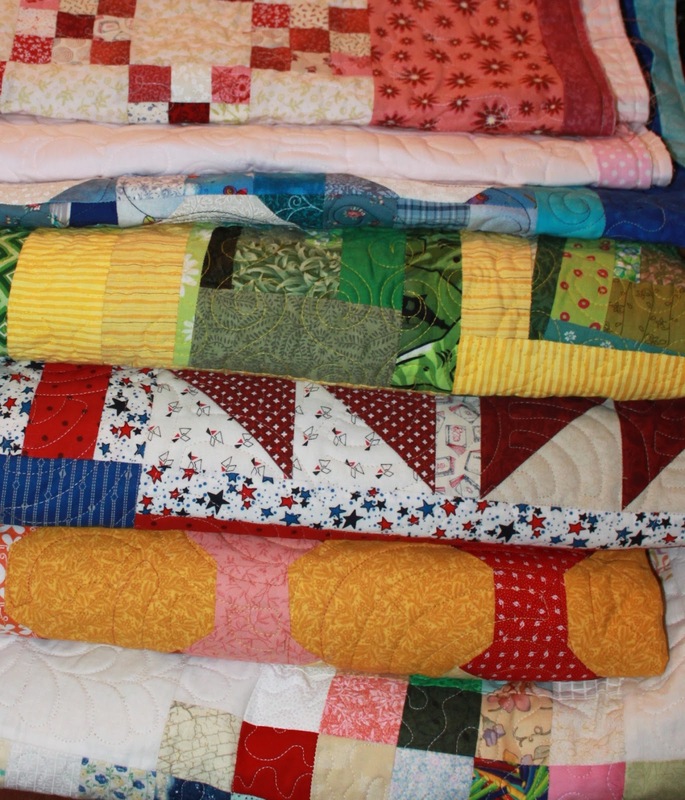 They are all neatly filed away now with a new set of nine patches are matched up and ready to go. By the time that was all done it was time to go and start the camp pick up route. Then we got home and tidied the kitchen after the kids helped me clean out my car. Not a bad vacation day all. If it goes on long enough I'll actually get to all the little projects on my list. Smith Mountain Majesty is overfilling my design wall today. 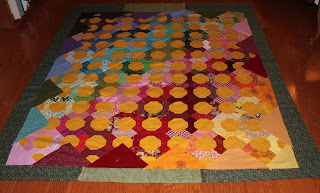 There are still a few more blocks to put together, but I can definitely see how it is coming together. 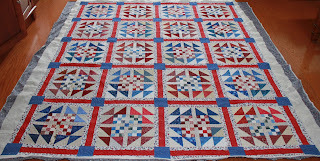 This one is another pattern from Bonnie Hunter's Scraps and Shirtails II book. I love the way the alternate blocks surround the stars. To see what other people have up on their design walls, head over to Judy's blog. Such a fun way to start out the week. 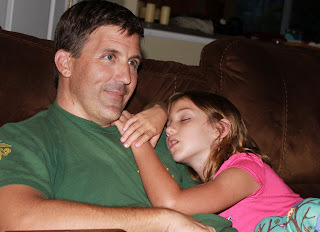 Sydney wanted to snuggle on the couch last night, I wonder when they get too big to pass out cold on somebody? Not too soon I hope. So slowly, the Smith Mountain blocks are coming together. Goodness do they have a lot of little pieces! 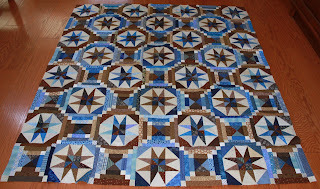 The center portions all got finished up last night, and I thought the stars would come together easily enough today. Instead, the Chimney blocks are almost finished. 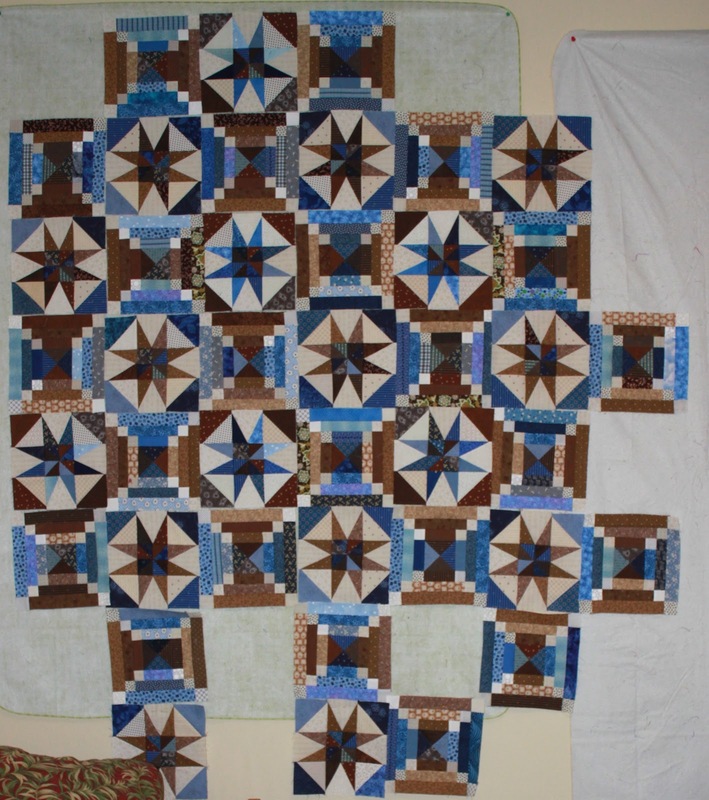 I did put a few stars together to start to get a feel for how the quilt will look. Sometimes I get impatient with working one block at a time and just want to see them start coming together. Sunday is Pizza night, so maybe I'll get a few more put together a bit later. The boys have been gone all day playing Dungeons and Dragons so they are going to pick it up on the way home. All the subunits are done for Smith Mountain! 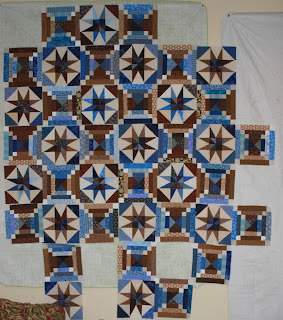 I have them all counted and ready to go for the star blocks. The center for the alternate blocks are set to go as well, and the logs are cut to length. 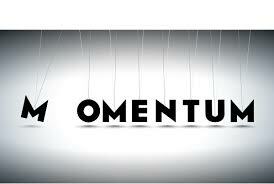 As much as I would love to keep going while I am on a role, I am switching gears. We ordered new patio furniture a couple of weeks ago, and it has started to arrive. Cleaning and painting of the pool deck is on my summer list, and it would be nice to get it done in time for the new patio set. So I'm off to pressure wash and acid etch. I'm not sure we will be rain free for long enough to paint, but I'll get a start at least so I can feel like something has been accomplished. How cute are these little purple log cabin blocks? I whipped up a few in purple and then started to think about layouts for the collection. Maybe something like this? Use the linky below to share your own purple progress or ponderings (I think Mr. Linky is having issues today) If you are not able to leave a link, please leave a comment instead. I will try to figure out why it isn't working. Anna didn't want to have a party for her birthday this year. Instead she wanted to take a friend to Universal Studios and ride the new Harry Potter ride. She chose a friend whose mom is a good friend of mine so that we could hang out while the girls did their thing. I was pretty sure we were going to be rained out, but somehow, the rain magically parted around Orlando and we remained almost entirely dry for the day. 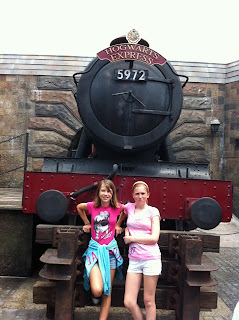 Until, that is, the girls decided to ride the river barge ride 10 times in a row! Hogwarts village was amazing, the detail of the architecture was SO impressive. Such a fun day, I was feeling great and still full of energy all the way home, then I sat down on the couch and lost ALL motivation. I thought briefly about getting a little work done on Smith Mountain before dozing off in the middle of my move on Words with Friends. Tomorrow looks wide open though. Sydney has a sleepover and Ryan has been invited to a pool party of someone he met at Rocket Camp, other than that it should be a calm day. I even have some purple projects to show! 12:30: Finally, time to sew! After only a little bit of reverse sewing, I got the top for Goose Puddle finished up last night. 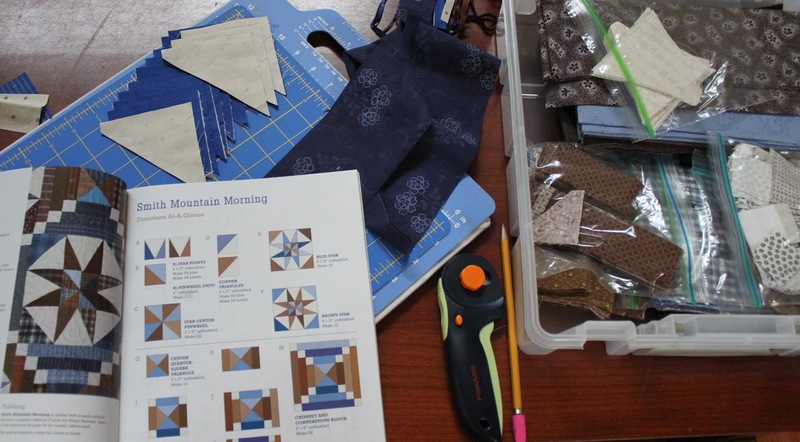 I was ready bright and early to start on a new quilt. Unfortunately, there were just a few errands to take care of first. I think I'll spend the afternoon watching the kids swim while I cut out the rest of Smith Mountain Morning. 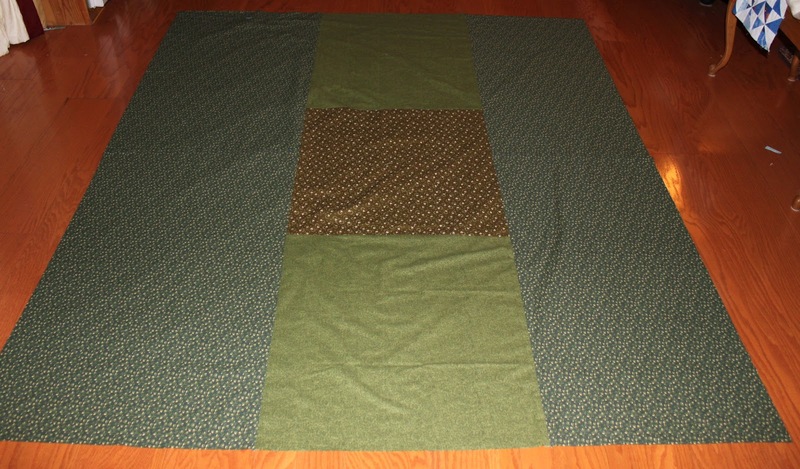 I got all the blocks sewn into rows last night, but lost steam before sewing the rows together to make a flimsy. 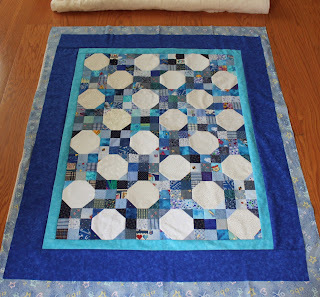 I really do like the plain blue squares now that I see it all together. I might do one more red border to finish it off, though with the outside sashing I'm not sure I need it. 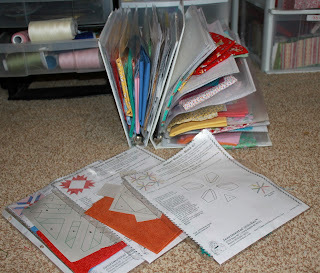 Instead I organized all the scraps and extras from the project box that it was living in. 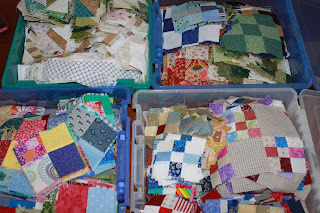 I'm not sure what will go in that box next, maybe some bigger nine patches that I was playing with last summer. I saw the coolest idea and Annie's Quilt Ort's on Monday that I was thinking about. I went out and took Lizzie for a walk first thing this morning, which is good, because now it is raining. I'm not sure what Sydney's plan for the day is, but it doesn't look like a good zoo day. She wanted to do the big ropes course, but isn't tall enough. Maybe we will go and get our nails done instead. It would be a great movie day, but since we saw one yesterday we will have to think of something else. First though, I'll have to get every one else delivered to camp. I'm not sure how many wrong ways there are to sew a simple pieced sashing and cornerstones, but I must have tried them all. I wasn't loving the scrappy sets made from 1.5 inch strips. In looking back at the pattern, they showed a consistent red and light red which seemed like a good idea. 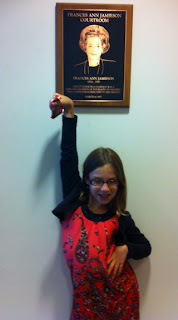 Sydney went with me yesterday and picked out a nice red with dots and patriotic star imprinted background fabric. I promptly prewashed, ironed, and whipped up 49 pieces of sashing. 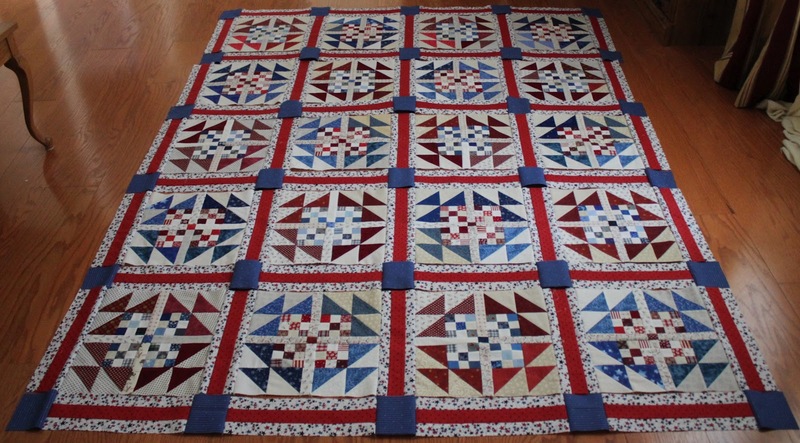 It wasn't until I sat down to cut out the blue pinwheel cornerstones that I realized the red was supposed to have been cut at 2.5 inches, instead of 2, leaving the final width at 4 inches instead of 4.5. I almost started doing the math to figure out how to make pinwheels that would fit when I decided that plain blue squared look really good. They look even better than pinwheels would look -- right? Sydney and I went to see MIB 3 this morning and then came home to a very surrealistic experience with subpenas. Ryan had another great day at rocket camp and is currently up in the toy room looking for something to launch into space tomorrow. Anna was less than impressed with the Pythagorean Theorem at math camp, but said that lunch was super fun. Summer is already zooming by and it has barely started.